The frittatas are a combo of egg with a starchy filling like potatoes or beans. Here, piri-piri is used to season the frittata and to make a sauce to serve with it. 1. To make Piri-Piri Sauce: Stir together all ingredients in saucepan. Bring to a boil over medium heat. Cook 1 minute, then remove from heat, and cool. Transfer to jar. 2. To make Frittata: Whisk together eggs and parsley in bowl. Season with salt and pepper, if desired. 3. Heat 1 Tbs. oil in 10-inch skillet over medium heat. Add onion, and sauté 6 to 8 minutes. Add beans and Piri-Piri; sauté 1 to 2 minutes, or until spices darken and stick to beans. Remove from heat, and stir bean mixture into egg mixture. 4. Wipe out skillet, and heat remaining 2 Tbs. oil in skillet over medium heat. Spread egg mixture in skillet, and cook 2 to 3 minutes, stirring and lifting mixture to allow even cooking. Cover, reduce heat to medium-low, and cook 10 to 15 minutes, or until egg is firm and cooked through, lifting and stirring occasionally. 5. 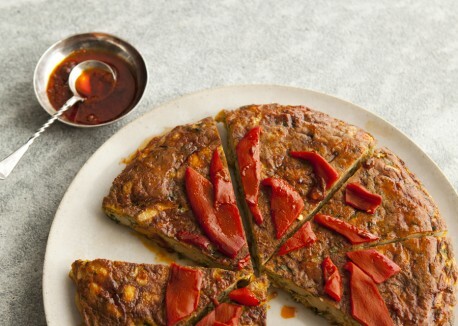 Invert frittata onto serving plate; cool to room temperature. Garnish with your choice of peppers and sauteed veggies, and serve Piri-Piri Sauce on side.